Are you a first time cat parent? Well! The joy and feeling of being a cat parent is something, which cannot be expressed in words. Pet parenting or ‘Cat Parenting’ involves both love and care. It is a crown, which comes with great responsibilities. A new cat parent would find himself in a dilemma on the question of how to ensure his feline’s health and ways to enrich her life. 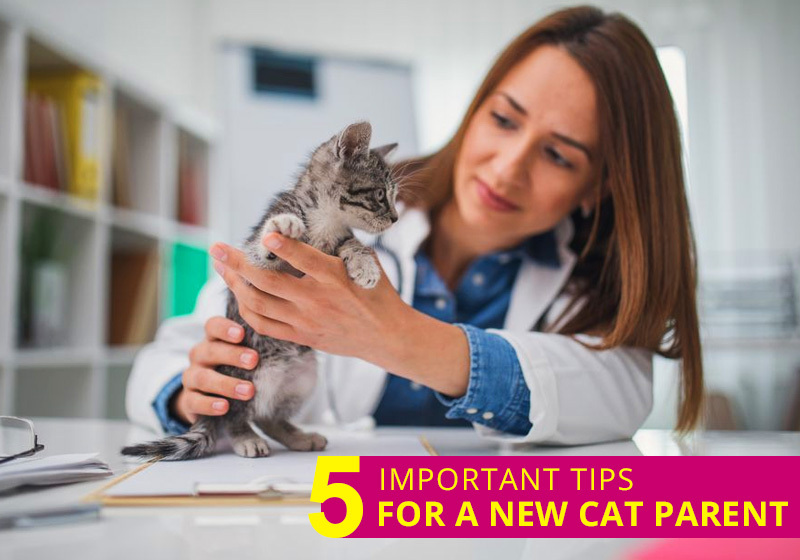 Taking account of this new cat parent’s situation, we present you five basic tips, which a cat parent must take note of to safeguard his feline’s overall health. A vet is the ideal person who can clear all your doubts regarding your kitty’s overall well-being. He can determine nutrition plan according to your feline’s age and breed. A vet can aware you about various cat health issues and preventive measures to address the same. As a new cat parent seeing a vet is must to know all the strings attached with cat parenting. However, even after you enter into the club of mature cat parents, regular vet visits are must to stay updated on your cat’s health. ‘Right Food’ here means feeding your cat a healthy diet. Cats are increasingly becoming obese which makes them vulnerable to various health disorders including heart diseases. Therefore, as a cat parent give your cat a balanced diet. You may consult your vet to formulate a correct diet plan for your cat. The vet at the same time would also advise you to help your cat do some physical exercises. This detail is vital as certain breeds of cats are more at the risk of gaining obesity such as Birman, American Shorthair, or Persian. The vet in such case may present you a plan, which caters to your cat’s breed. At the same time, when buying cat food from outside (other than vet), check the food label and ingredients to suit your cat’s dietary requirements. Provide her a clean and appropriate litter box, which is of right size. Locate it at a place where your cat feels comfortable and private. Clean the feces of your feline regularly. Maintain the box regularly and change it every week. Although cats carry a picture of being good in self-grooming, like other pet species they need to be groomed to enhance their appearance and for maintaining their skin health and hygiene. Regular grooming of your cat includes bathing, brushing, combing her fur and trimming the claws, etc. Checking the presence of ear mites in your cat and removing the same with ear cleaning solution like Epi-Otic Ear Cleanser. Cat grooming is a broad concept, which ends with mastering the art of cat parenting as a whole. Consult your vet if you find anything suspecting when it comes to your cat’s body and behavior. Whether your cat is an indoor cat or an outdoor breed such as Siamese, the need for flea preventives and effective dewormers is advised by veterinarians to prevent both internal and external parasitic infections in cats. Therefore, follow the maxim of prevention is better than cure and include flea control products such as Bravecto to check flea infestation in your cat. Dewormers like Antezole Liquid Suspension or Drontal have also found acceptance among cat owners to protect their felines against intestinal parasites. Parenting involves care, responsibility, emotions and yes of course money too. While facilities play a vital role in maintaining your pet’s health, yet it cannot take the place of intimate moments that you can share with your cat. 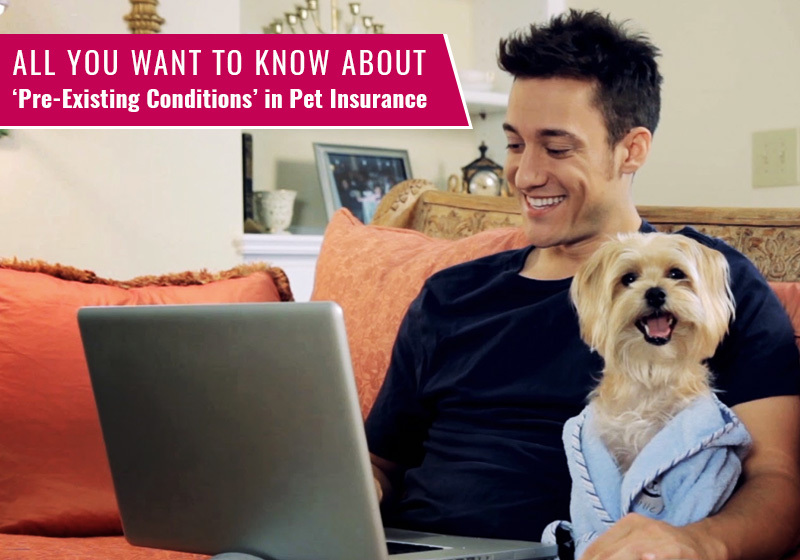 All You Want To Know About ‘Pre-Existing Conditions’ in Pet Insurance. Pet parents worry about their pets a lot and why not? They are part of the family. Many pet parents are exploring the option of pet insurance to safeguard their pet’s overall well-being. However, they come across clause such as pre-existing conditions, which makes them confused to whether opt for the policy or reject it. ‘Pre-existing conditions’ is a terminology associated with insurance policy. When you will go to any insurance company for pet insurance, you will come across this clause named pre-existing conditions. It means that if for instance, your dog or cat is battling with any illness or disease prior to the commencement of the insurance policy, then the insurance company will bear no expenses on your behalf as your pet’s illness has occurred before the policy begins. In simple words, the insurance company will not cover anything related to your pet before the policy comes into effect. The conditions or illness affecting your pet prior to the commencement of the policy is thus excluded from the coverage. Therefore, the timing of the policy matters here. Due to this very clause, it is advised to pet parents to opt for pet insurance when the pet is in its puppyhood. When it comes to pet insurance, it is advisable to insure your pet as early as possible. Secondly, at the time of signing the papers, read every clause of the policy carefully. Before that, do a detailed study of various insurance companies who are offering pet insurance. Write pros and cons of every insurance company. Choose the one, which you find suitable for safeguarding your pet’s health in future. A missing dog is one of the worst feeling unimaginable. The panic that sets in when you realize your dog is missing. This often happens when a dog is in someone else’s care, or in an unfamiliar area. Most pets are back with their family in the first few hours, but the odds of a reunion drop dramatically after the first day. 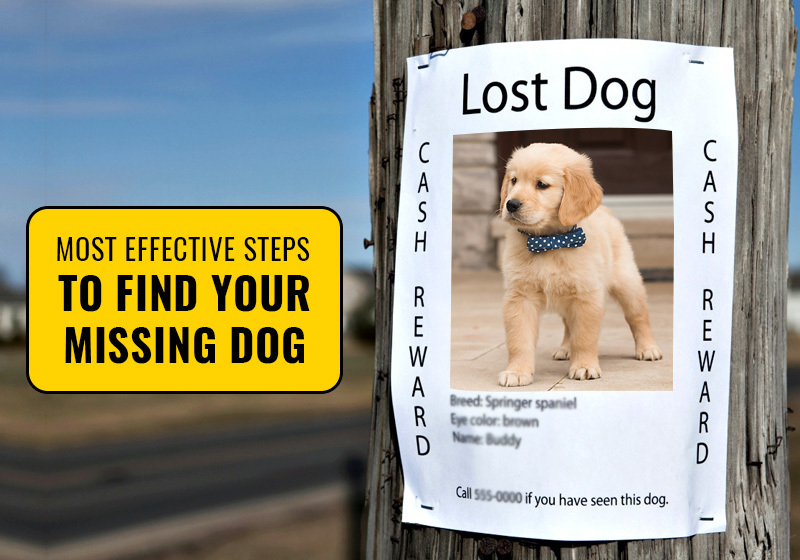 Give yourself the best possible chance of doing these things as soon as you realize your dog is missing. Immediately start searching for your pet in your neighborhood with whoever is readily available. It helps you to be organized and you don’t miss anything. Keeping such list handy will also help ensure you cover all your bases. If your dog just left your house, he may not be too far. Call out your dog’s name and immediately sweep your neighborhood. To get him to come to you, be sure to bring something extra tasty, like steak. Create flyers to post everywhere! Make sure you have an up-to-date picture and put your contact information, description of pet, collar color, date missing and any useful information. Don’t forget to put “reward” if you’re offering one. Put them everywhere, which gives you another chance to sweep your neighborhood in case your dog turned back or was hiding earlier and you missed him. Pet FBI provides you with a template that can come in handy in such a situation. Most shelters and animal control might not give you a proper reply over the phone if they have a dog that matches your dog’s description. Instead drive there and leave some flyers. That way, they will know your dog has a home, if your dog comes through. Remember, sometimes if they are full shelters can turn dogs away, but having the flyer will make this process easy for them. Don’t forget how powerful social media is! Request your friends and family to share your flyer on their Facebook page. Contact local dog groups and ask them if they will post it on their Facebook page. Search for Facebook pages as many states and cities even have their own pages just for lost dogs. Go to the local vets with your flyers so if anyone brings him in, they know where he belongs. It will help them find you quickly in the event of an emergency situation. There are good chances that you would be notified, in case your dog has been injured or worse if your dog has proper identification on his collar or a microchip. Don’t give up. Begin contacting shelters and police stations outside your immediate area broaden the perimeter of your search. Also, make sure you keep your ads current online and in the newspaper. Do You Know About Otitis In Cats? Ear infections in cats are also referred as Otitis in general and further differentiated specifically as Otitis externa- infection involving the ear canal or outer ear and Otitis media- infection in the middle ear on the basis of the condition. The inflammation of the inner ear is called Otitis interna. As a cat parent, if you come across any of these symptoms in your cat, consult your vet and follow the course of action as proposed by him. The vet will first diagnose the current state of your cat’s ear through X-rays followed by treatment depending upon on the result of the diagnosis. In general, the vet uses antibiotics, antifungal to treat ear infections caused by ear mites or bacteria. Timely vet treatment is important here as these ear conditions are time sensitive and if not treated on time, the cat may lose his hearing ability partially or completely. How To Prevent Ear Infections In Your Cat? The easiest and the best way to prevent Otitis or ear infection in cats is by ensuring regular cleaning of the cat’s ear. If you do not know how to remove the wax or debris from your cat’s ear, then take the help of your vet. He will guide you in performing this process but never try on your own if you do not know the correct procedure. However, general cleaning of a cat’s ear is performed with the help of an ear cleaning solution such as Malacetic Otic Ear and cotton ball. To start this activity, just add few drops of Malacetic Otic Ear solution in the kitty’s ear. Wait for few minutes. Now gently rub at the ear base, making wax and debris come out in the upper part of the ear. Use a cotton ball to remove the debris and wax. On completion of this process, gift the cat her favorite treat to create a positive impression in her mind regarding this whole process. As a rule, never let your cat exposed to other infected cats and groom her regularly. This will protect her from future ear infections. National Pet Day is here! 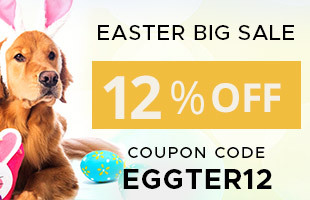 It’s time to show your pet some extra love and spoil them endlessly. National Pet Day was founded in 2006 by Colleen Paige. She dedicated this day to celebrate the happiness and joy pet brings to our lives on a daily basis. National Pet Day isn’t just celebrating the pets at home, but dogs and cats everywhere. This day was also founded to create public awareness about all the different animals awaiting a forever home in shelters around the world. Let’s have a look at some of the ways that would help you make your pet feel special. Just like you, your pet deserves some homemade treats every once in a while. There are countless options for homemade pet treats. Some of the most common homemade treats are pet cookies, dog biscuits and dog bones. They sound like normal treats, but once you add in different delicious flavors, your furry friend will love you forever and keep begging for more! It’s great to have photos of your pet all around your home. MoreoverPlus, as your pet grows older, these pictures will mean the world to you as you recall every wonderful passing year with your best four-legged friend. The more photos you have the better, so call up a friend or hire a photographer. Take lots of pictures and share them over your Facebook page, Twitter and Instagram, or proudly display your pet portraits around the house. Take more active pets on a rugged hike or choose a trail that leads to a lake for a swim time. You can also find dog-friendly hiking areas. Older or less active pets will find a trip to the park fun or take an extra long stroll around the neighborhood with the whole family. You can also take your pet on a farm and spend time running around and playing with your awesome farm animals. County animal shelters and non-profit rescues are mostly in need of all kinds of animal necessities. Donate things like food, treats, blankets, toys, training pee pads or contribute funding in your pet’s name. This is a great way to celebrate National Pet Day. So, take your pet out to a park, bring home some new toys or just cuddle up and watch a movie together. Whatever you choose, either way, show them extra love on this special day. Happy National Pet Day!